Many Americans believe our presidents were heavy drinking hard men. The information that follows investigates the myth of heavy presidential drinking. 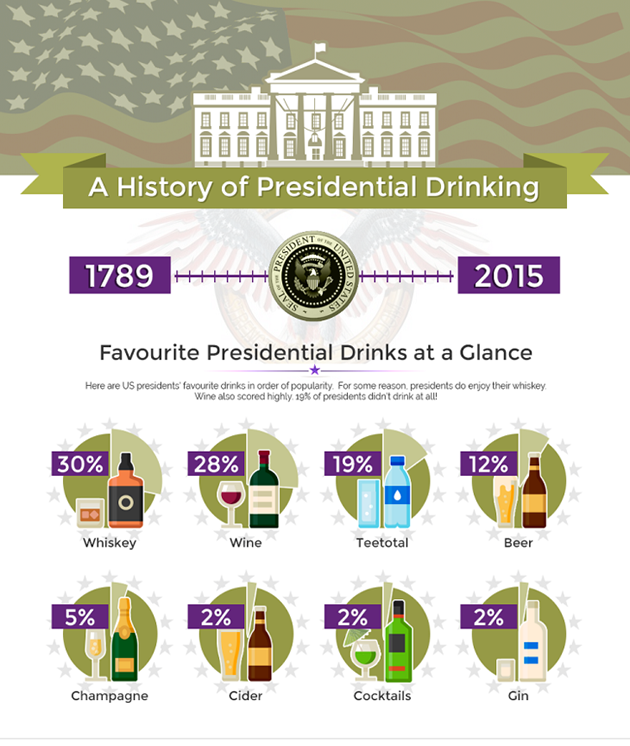 The research reveals the majority of US presidents were moderate drinkers. With 19% who elected to drink no alcohol whatsoever, teetotal. Therefore, contrary to what most people assume, we must cast aside any notion that US presidents were heavy drinkers. The data suggest a couple of simple messages to young and old. Most US presidents are positive role models for avoiding alcohol. If you wish to get ahead, don't drink excessive amounts of alcohol. The table below includes data for each president: the years they were president, their favorite drink and a grade for the amount of alcohol each president drank. Grades are determined by how much alcohol each president drank on a scale from zero (0) to five (5). Teetotal presidents are graded 0 and heavy drinking presidents are graded 5.